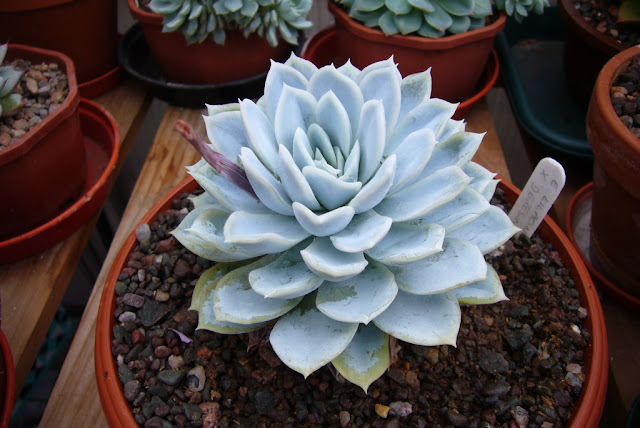 I haven't posted about the echeverias much recently and thought it was time for this years post on the blue / white ones. The colour is created by the fine powder or bloom on the leaves. It is this powder that makes people reach out to touch them much to my horror. In last years post, found here, I focused ore on the pale green / blue ones. This year there are a few new ones for you. This is a good plant, apart from the lovely pink tinge to the edge of the leaves it offsets freely. It can get a bit leggy if your not careful, but then you just top cut and you have new plants to give to friends. A more structural variety is e. cante. My original plant was stunning, but suffered with the move. 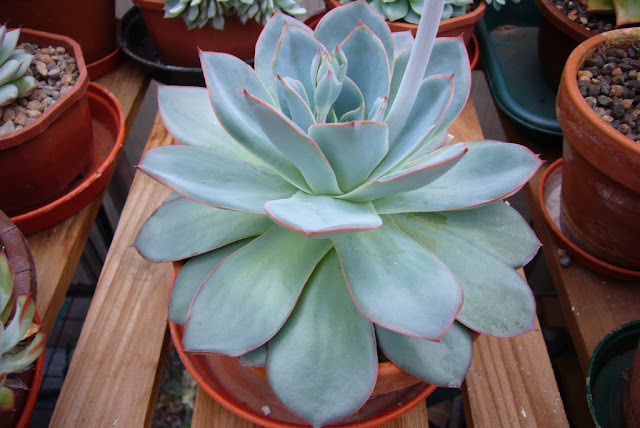 The great thing about echeverias is that you can usually refresh plants, by top cutting. You have a year while the plant re-roots and settles, then they get into growth and you have a whole new plant. The white and blue plants are some of my favourites, so it is not surprise they turned up in hybrid attempts. 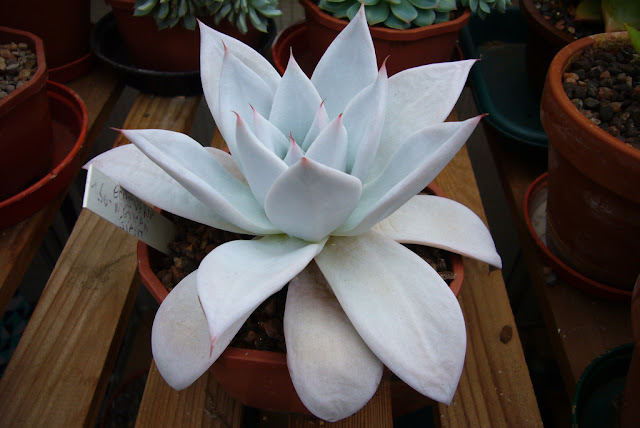 The most successful is the echeveria lilacina x deresina. It falls about half way between the two in leaf shape, but has the strongest white. Sadly the bloom does not stick to the leaves and it marks really easily. One of the best echeverias in my view is e. subrigida. It is large, structural with good flowers. What is not to like. It is no surprise that is has been use in several hybrids around the world. A few years ago I got some seeds from the US of e. subrigida x e. peacockii. There was a fair amount of varition in the resulting seedlings, both in form and colour. This one has the strongest colour, but a weaker shape. It is still a lovely plant though. A more recent purchase is this echeveria 'Brinks Blue'. It seems to be along the e. cante forms, the colour is even better and is bigger as well. The problem with all these white plants is watering and re-potting. There is always the dilemma of over-potting to give space to water, or using the correct pot size and risk marking the lower leaves. This plant is a prime example, having just been re-potted and having limited space to water from above. 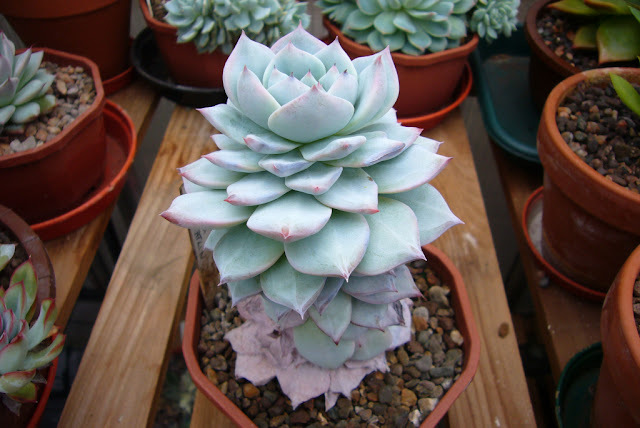 This has to be one of the iconic echeverias. 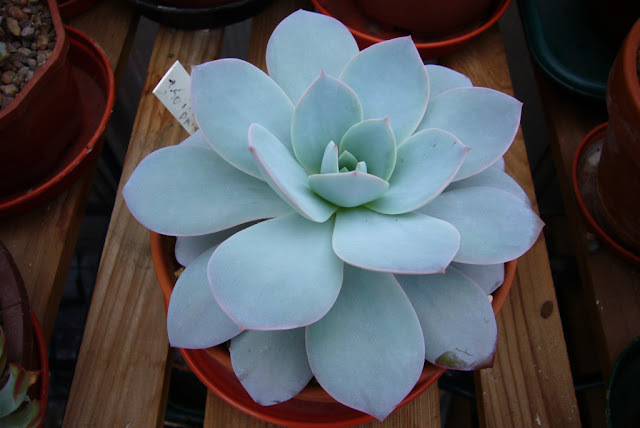 More than any other echeveria, I think it needs to be grown well. Healthy well cared for plants are simply stunning. Mine isn't too bad, the colour is good and the leaves are good and healthy, sadly it does lean slightly and isn't perfectly symmetrical. Firstly the mystery, I can not find anything on this plant. It was bought from a British Cactus and Succulent Society show years ago. At the time I hadn't been collecting for long and didn't know it was unusual. Years later and now everyone asks about it, and no one sells it. Add to this that it doesn't seem to prop, or should that be I haven't managed. Top cutting didn't work, leaves didn't work and so far no offsets. It has turned into a strange plant, getting taller all the time. Last but not least is E. mexican giant. When purchased I was assured it would become my favourite echeveria. It is turning into something special, with the almost pure white colour that e. laui has. Plus it's going to be big, and very structural. You have to keep an eye on the watering. As you can see the leaves can shrivel and they never totally recover. I hadn't realised how many white plants I now have. At this rate no one else is going to be allowed in the greenhouse incase they touch any of them. "It is this powder that makes people reach out to touch them much to my horror"...indeed! 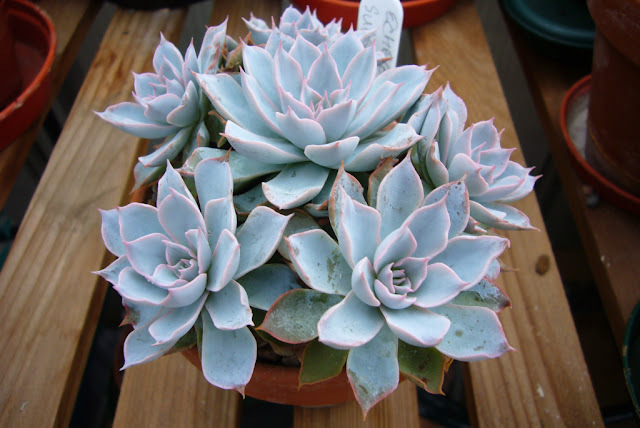 I used to have an Echeveria 'Afterglow' at the center of our patio dining table. No more! People couldn't keep their hands off it. You've got a lovely collection! Thank you. This lot are all in the greenhouse where I can control peoples need to touch. 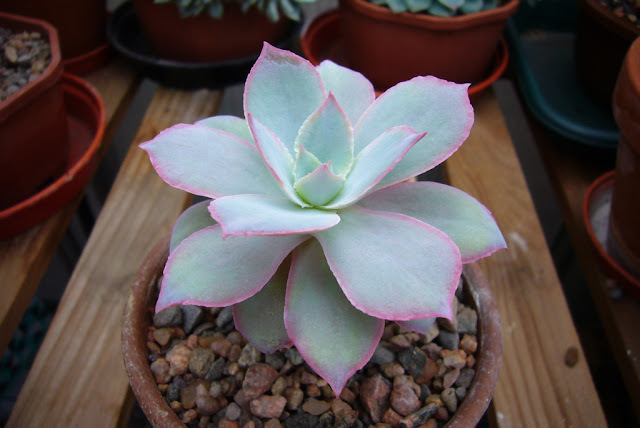 So glad you did a post on your Echeveria collection, they are all exceptionally stunning! 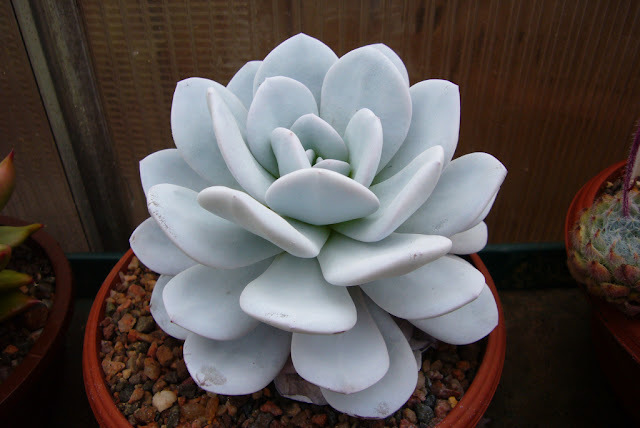 I'm a sucker for white Echeverias, so every single plant you posted are soooooo.. drool worthy! I have 2 E.Laui, and a Mexican Giant too, I was just wondering how often do you water them? My Mexican Giant seems to be shriveling more of its lower leaves after I started implementing a more stricter watering routine, and now the leaves seem to suffer. I'm always afraid of over-watering and rot, since that's how I lost my 2 new variegated plants - I watered them after seeing lower leaves drop at a very fast rate, but dying leaves are also a sign of overwatering too. I'm determined the plant is still good because it has some healthy aerial roots poking out under its leaves, but it's just the drying lower leaves (it's not a few, but about 4-5) that worries me. Thank you. I water them about once a week at the moment, but this week when it has been cold and wet outside, I held off watering as the soil wa still damp in some pots. What a gorgeous collection. I know not to touch but might cause spotting by drooling over them. My cantes get dusty--a problem in a dry area. The laui is magic. You are doing a great job with them. Bravo! Thank you. You would have very different problems to us, we don't really suffer from dust problems in the UK much, apart from when dust from the Sahara blows in. Crassula sarcocaulis are suddenly everywhere. Starting the annual pup cull.